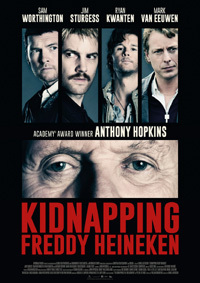 In the early 1980s a group of desperate Dutch friends (whose business plans backfired) decided to kidnapped Freddy Heineken, the man behind the famous beer. As is always the case, things seem to be going their way (after robbing banks to fund this elaborate kidnapping scheme - involving using their building skills to create a soundproof cell for Heineken and his driver). But as is so often the case (not just in movies, but also as here, in real life), emotions, egos, suspicion, distrust, general panic and psychological fatigue leads to things teetering on the verge of falling apart, even when it looks like the excessive ransom will be paid. The '80s time period is replicated and captured well, but I think I would've been drawn in more had this been a Dutch film with subtitles, the various nationalities of British and Australian actors amid some Europeans sometimes had me out of touch with the Netherlands location of these events. These were the kind of stories I remembered from weekly rag magazine Die Huisgenoot here in South Africa while at school in the '70s and '80s, but was never aware of this specific case until this film. We've seen many a kidnapping movie, but this has a tense edge and is well worth watching.